That's a handsome m12. I have one of those also, acquired from the CMP. It's a shooter, and the bolt is super-smooth. What's the story on the scope rail?--looks like a very nice installation. Ken dose quality work, fit and finish are perfect. That is a great looking scope base! I see he makes one for my Win 52 also... Nice. Any drilling and tapping required or does it fit factory holes? Any drilling and tapping required or does it fit factory holes? The Viani base mounts at the rear barrel base holes and the receiver base (Redfield base) holes. No drilling or tapping is required. The pic on the link really dose not do justice to the finished product. I like the H&R 12 and the Model 52. Those are some nice groups from that 52. I have several 22 & 22 mag but not quite in this league. But I wouldn't trade what I got. I am now cleaning my Marlin 783 22 mag. Shoots 5/8" groups at 100yd. My best shooting 22 is a Remington 341, no scope use it along all with my other 22's at Boy Scouts. Every kid that shoots it puts the 3 shots under at quarter at 25 ft.
My Walthar Comp pellet rifle will out shoot anything I have at 20 yds. But that's a horse of a different color, probably out shoot all those nice 22's also. Anschutz 1411 prone rifle. I replaced the hooked buttplate with a rubber unit, as the hook prevents the rifle from nesting in as close to the neck as I like it. It also lost the Anschutz rear sight in favor of the much more familiar REG E5D. This is just a "fun gun" not a serious competition piece. It is a Savage MkII in a new homemade stock. I have worked on the trigger and polished the crown. It will shoot 5/8 inch groups at 50 yards (5 shots) with cheap ammo it likes. 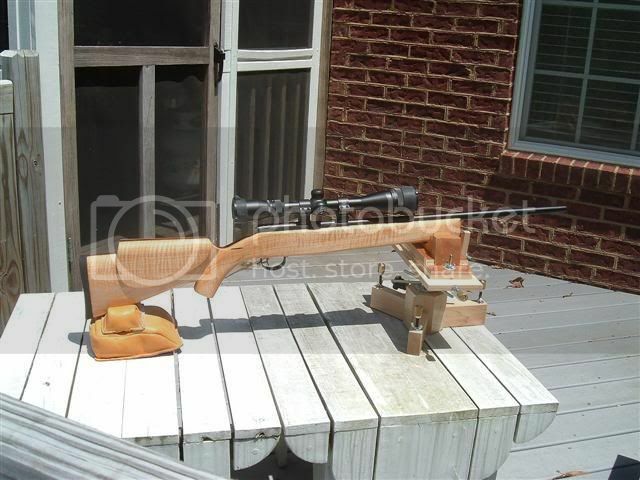 I just scored this Savage / Anschutz off Guns America. I will post some better pics when it gets here. I want to use it for BR practice at home and at the range.